What an exciting time it is to shop for your engagement ring! Jim Summa, of Summa Jewelers in Kirkwood, Missouri discovered the fun and excitement of diamonds and gemstones when he was just 14 years old. Jim and his staff of four offer you over 100 years of experience in the fine jewelry business and “more credentials than you can shake a stick at.” They love sparkling diamonds and gems, they also love sharing that knowledge with you, their customer. 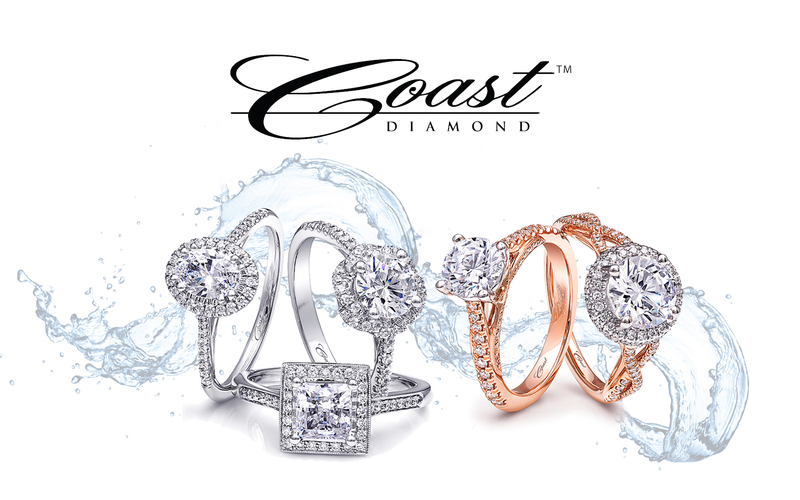 This is why Coast is proud to call Summa Jewelers of Kirkwood, MO our Coast Diamond Retailer of the Week. The excitement of shopping for your Coast Diamond engagement ring at Summa Jewelers begins with choosing the perfect setting. Then the fun really begins for Jim Summa… helping you choose the perfect center stone. The viewers at Summa Jewelers allow you to see the unique characteristics of each center stone, so you can pick the ideal one to complete your engagement ring. This radiant Coast Diamond halo engagement ring (LC5205) was created for a 1 carat round center stone. Choose her favorite colored gemstone to make it uniquely her. This bold Coast Diamond 1.5 carat halo engagement ring (LC5324), with a diamond encrusted band, is the perfect choice for a cushion shaped or round center stone. Choose tradition, while making a statement, with this Coast Diamond 1.5 carat solitaire engagement ring (LJ6033) with diamonds cascading down the band and matching wedding band (WJ6033). A solitaire engagement ring allows the most opportunity to customize an engagement ring when choosing the size and shape of the center stone. Congratulations Summa Jewelers in Kirkwood, MO for being our Coast Diamond Retailer of the Week! Coast Diamond loves anything vintage, that is timeless, making it appealing for years and years. For 101 years Rufus Lewis Jewelers has been a timeless establishment, diligently serving customers in Spartanburg, South Carolina. Since the beginning Rufus D. Lewis has been known for being in tune to their customers’ needs. This love of the customer has been passed down through three generations of the Rufus family and has led to a rich heritage in the fine jewelry business. Coast Diamond loves the family tradition of excellent customer care that Rufus Lewis Jewelers has built in Spartanburg, SC and we are pleased to call them our Coast Diamond Retailer of the Week. Rufus Lewis Jewelers’ reputation for their diligent care of the customer began when they were one of the first stores in Spartanburg, SC to have air conditioning, so their customers could shop in comfort. Today, their 101 year heritage of customer care is evident in the gorgeous antique showcases that have beautifully displayed their fine jewelry collections for decades. Today, the antique showcases in Rufus Lewis Jewelers highlight our Coast Vintage Collection beautifully. Our Coast Diamond Vintage Collection celebrates the timelessness of the most loved details of the engagement ring. The Vintage Collection includes exquisitely crafted platinum engagement rings and wedding bands. Each ring is beautifully hand engraved, making each ring a work of art. A Coast Diamond petite wedding band (WC5191H) is the perfect complement to any vintage engagement ring with its pavé set diamonds and milgrain edging. Equally exciting is their ability to stand alone or be stacked together. They make a fantastic Valentine’s Day gift for the one you love. Congratulations to Rufus Lewis Jewelers of Spartanburg, SC for 101 years of diligent customer care in the fine jewelry business and for being our Coast Diamond Retailer of the Week! There is no place more passionate about helping you celebrate romance and life’s big moments than J. Brooks Jewelers in Salt Lake City. With over 200 combined years of experience in the jewelry business, J. Brooks wants “every person who enters our stores to enjoy an experience of friendship and hospitality; with assurance, satisfaction and peace of mind.” For their love of romance and the personal care of their customers, Coast Diamond chooses J. Brooks Jewelers of Salt Lake City as our Retailer of the Week. Visit John Brooks Branscomb and the staff of J. Brooks Jewelers to find the most romantic Coast Diamond engagement ring. A most exhilarating moment as a couple is your engagement. J. Brooks Jewelers wants to help you find a stunning Coast Diamond engagement ring and wedding band that represent the romance in your life. This halo engagement ring from the Coast Diamond Romance Collection is a best seller at J. Brooks Jewelers year after year. The Romance Collection highlights tradition through romantic engagement ring styles. Pavé set diamonds are a classic accent to this Coast Diamond Romance Collection engagement ring and a desire of many brides because of the brilliant sparkle they create. Milgrain edging is a vintage detail that beautifully decorates this Coast Diamond band that can be worn alone, stacked with other bands or be the perfect companion to many Coast Diamond engagement rings. This graceful Coast Diamond Romance Collection wedding set combines every timeless detail for bridal perfection. Congratulations to J. Brooks Jewelers, Salt Lake City for being our Coast Diamond Retailer of the Week! For over 20 years Robert Lance Jewelers in Lubbock, Texas has made a promise to offer their customers exceptional attention and service with integrity at every visit. The Robert Lance jewelers listen to your needs and ensure you are a well educated buyer before you leave with the engagement ring of your dreams. We are thrilled to announce Robert Lance Jewelers as our Coast Diamond Featured Retailer of the Week for their continued commitment to provide a fantastic engagement ring buying experience to their customer. Coast engagement rings found at Robert Lance Jewelers are completely customizable for any shape or size center stone making each ring as unique as the person wearing it. The elegant modern bride loves all the trending features of a Coast Diamond engagement ring with a little something unique to make it personal to her. The halo engagement ring is always a popular choice at Robert Lance Jewelers. The surprise of a peek-a-boo diamond adds an extra touch of sparkle to thins halo ring. The perfect way to make elegance, modern… Take a 1.5 CT diamond center stone and add a double row of dazzling diamonds to the band. A gift sure to surprise the elegant modern woman in your life is a Coast Diamond band to adorn any finger on her graceful hand. Congratulations to our Coast Retailer of the Week, Robert Lance Jewelers for your commitment to integrity and exceptional customer attention in the Lubbock, TX community!